Balloon Burst is a simple but fun, and extremely competitive game where two players race against each other to pump up and burst their balloon using the detonator style pumps. For extra amusement instead of the having the balloon unit in front of the participant try having the players face forward with their own balloon behind their opponents backs. Then race to make it explode and make them jump! It's great fun for all types of event whether it be for some post-dinner fun at a conference dinner, part of a team building day, or an attraction at a fete or promotion. Balloon Burst is suitable for use by people of all ages from age 5 to adult and can be played indoors or outside. 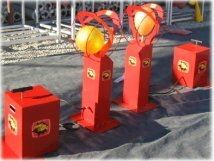 A pair of pumps and detonators are supplied for head to head competition. You'll need an area of just 6ft wide x 5ft deep and this includes room for the games participants to stand. 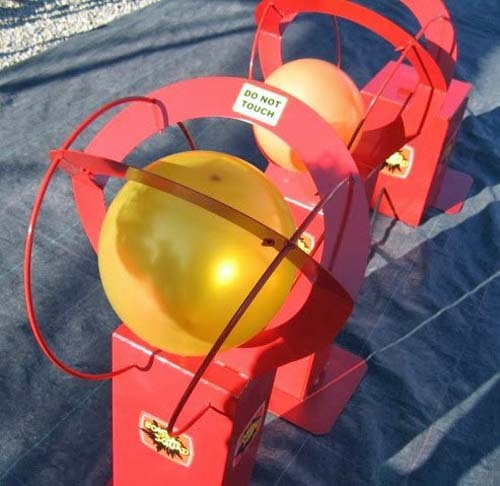 The Balloon Burst game does not require power so no electric supply is required. If you have any queries, questions, or would like to hire the Balloon Burst Race please click here to enquire and we will do all we can to help.